"Experience the epic clash of queens that changed the course of history." 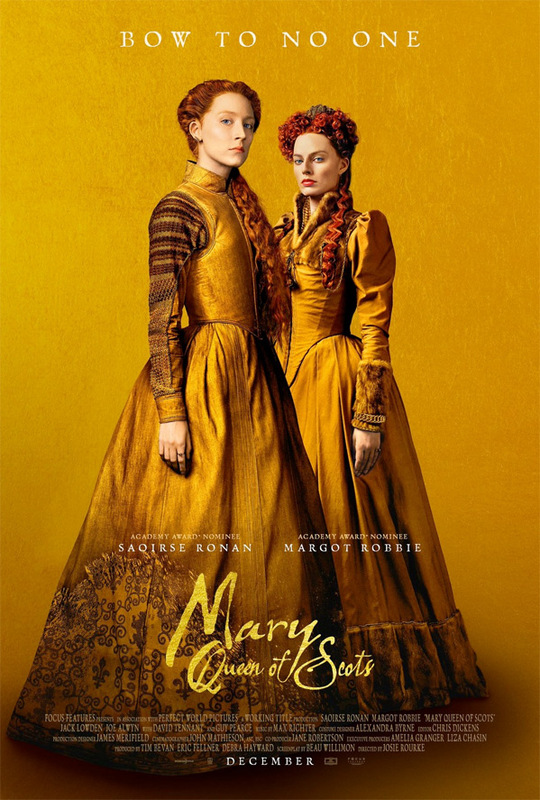 With the film opening in theaters in just a few days, Focus Features has released a third & final trailer for Josie Rourke's Mary Queen of Scots, telling the story of the turbulent life of the charismatic Mary Stuart. She was Queen of France at 16, then widowed at 18, deciding to return to Scotland without a husband, where she has to carefully compete with her cousin - Queen Elizabeth I of England, ruling over Scotland and England at the time. This has been getting some strong reviews, but there's not too much buzz yet from regular moviegoers. Saoirse Ronan plays Mary, Margot Robbie plays Elizabeth, with a superb ensemble cast including Gemma Chan, Guy Pearce, Joe Alwyn, David Tennant, Jack Lowden, Brendan Coyle, Martin Compston, Ismael Cruz Cordova, and James McArdle. With so many other trailers before, I am not sure this one is going to suddenly sell you if you're not already curious. It's more of a reminder that the film is opening this week. You can still see the first trailer for Rourke's Mary Queen of Scots here, or the second official trailer here. Mary Queen of Scots explores the turbulent life of the charismatic Mary Stuart (Ronan). Queen of France at 16 and widowed at 18, Mary defies pressure to remarry. Instead, she returns to her native Scotland to reclaim her rightful throne. But Scotland and England fall under the rule of the compelling Elizabeth I (Robbie). Each young Queen beholds her "sister" in fear and fascination. Rivals in power and in love, and female regents in a masculine world, the two must decide how to play the game of marriage versus independence. Determined to rule as much more than a figurehead, Mary asserts her claim to the English throne, threatening Elizabeth's sovereignty. Betrayal, rebellion, and conspiracies within each court imperil both thrones – and change the course of history. Mary Queen of Scots is directed by English theater director Josie Rourke, of the 2011 adaptation of Much Ado About Nothing, who is mainly an experienced theater director. The screenplay is written by Beau Willimon, adapted from John Guy's book about Mary Stuart. Focus Features will release Mary Queen of Scots in select theaters starting December 7th, 2018.